Kaiju News | Everything Kaiju: Motley Fools ask "Can the "King of All Monsters" deliver? 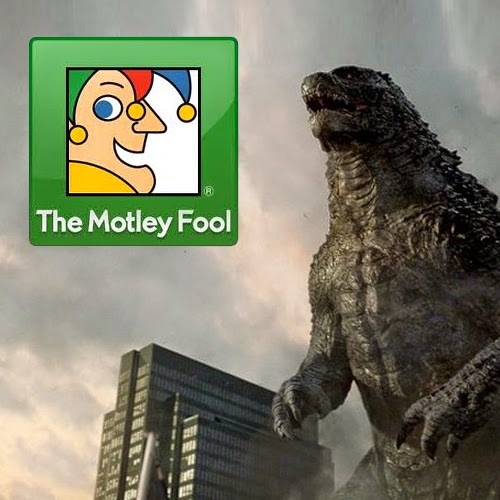 Motley Fools ask "Can the "King of All Monsters" deliver? Should you decide to invest in Warner Bros based on Godzilla? The Motley Fool is mostly a hub for the investment community; they cover investment trends, stocks and securities. They also cover entertainment, albeit with an investment bent, but once in a while the talk comics, TV and Movies. Enter, Tim Beyers. We've covered Mr. Beyers before, back when he admitted he was wrong about Godzilla. Well he's talking Godzilla again with fellow analyst Nathan Alderman. Read an expert of what they both have to say below or jump to the video below. Tim says that initial reaction to Godzilla appears to be positive. The movie's style also seems to recall the slow and terrifying reveal of director Gareth Edwards' Monsters, an independent movie that vastly out-earned its modest budget. Vulture quotes Edwards as saying he was also influenced by Jurassic Park, which holds off showing the biggest dinosaurs till more than an hour into the movie. How that will play with audiences is impossible to know at this point. But initial tracking says we can expect a $60 million debut and $500 million to $600 million in worldwide grosses by the time the movie ends its run in theaters. An impressive -- and likely profitable -- performance if those numbers hold, Tim says. Nathan says that Warner investors shouldn't expect a massive hit. Last summer's giant monsters vs. giant robots epic, Pacific Rim, had trouble appealing to American audiences. Foreign moviegoers helped push the movie's overall tally to better than $400 million in grosses, yet that probably wasn't enough to produce profits after accounting for marketing, distribution, and revenue sharing with theater operators. "Can the 'King of All Monsters' deliver?" 1-Up On Wall Street host Ellen Bowman puts this question to analysts Nathan Alderman and Tim Beyers in the video below.